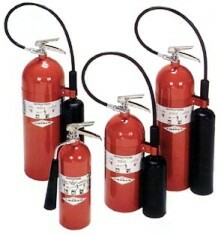 CO2 Fire Extinguishers are used for fires labeled Class B and C. They will put out fires that start from materials such as flammable liquids, solvents, lacquers, oils, gasoline, grease, oil based paints, lacquers and energized electrical equipment. This type of extinguisher is filled with carbon dioxide which is a non-flammable gas under extreme pressure. It is also very cold so it actually “cools” the fire. You might even see pieces of dry ice shooting out as it puts the fire out. A CO2 will extinguish the fire by taking the oxygen away from it. We carry Amerex and Badger Extinguishers. They are perfect to use in most labs, flammable liquid storage areas, commercial kitchens, mechanical rooms and factories. Once the fire is out- you will not find residue with a CO2!